On Monday the governor of Ekiti State, Ayodele Fayose, a relentless critic of President Muhammadu Buhari, stirred yet another controversy. He told journalists that he had gone to do some transactions at a Zenith Bank branch in Ado-Ekiti, the state capital, but was shocked to find that his account with the bank had been frozen by the Economic and Financial Crimes Commission. Mr. Fayose, who by virtue of being a governor enjoys constitutional immunity from criminal prosecutions, said the decision to freeze his account was illegal. He however suggested that the freezing of his account was connected with ongoing investigation by the anti-graft commission into the campaign funding of the opposition Peoples Democratic. “I found out that the EFCC had blocked my account and the account of some of my associates. I see this as illegal. If you want to fight corruption, fight corruption based on rule of law,” he said. “I’m a sitting governor and under Section 308 of the 1999 Constitution I enjoy immunity. You must do anything you want to do within the ambit of the law. This government has no respect for constitutional provisions. They should not be in a hurry. In 2018, I will be done. I will come to them myself. I have become a figure in this country that I have nowhere to go. However, while confirming that Mr. Fayose’s account was indeed blocked, the spokesperson of the EFCC, Wilson Uwujaren, said the governor’s immunity does not stop the agency from investigating him. “It is true that we have frozen Governor Fayose’s account in connection with an ongoing investigation. We will soon release the details of our findings to the public. Mr Uwujaren did not give further detail of the nature of investigation Mr. Fayose is under. However, a top security source familiar with the investigation has given Premium Times a mind-boggling details of how N1.3 billion from the office of the National Security Adviser under the ex-President Goodluck Jonathan’s administration was traced to Mr. Fayose’s blocked account. 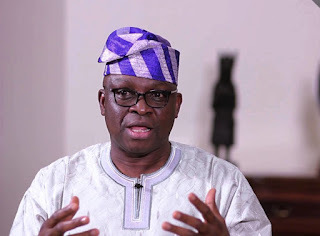 According to the source, the journey of how the money got to Mr Fayose’s account started in November 2011 following the incorporation of Sylvan Mcnamara Limited, a company linked to the sons of former Minister of State for Defence, Musiliu Obanikoro. Mr. Obanikoro and his sons, who are hiding in the United States, are also being investigated for the alleged misappropriation of the funds meant for the purchase of arms to fight the deadly Boko Haram insurgency in Nigeria’s north-east region. At inception, Silver Magna Merra had three directors – Ikenna Ezekwe, Adeniyi Elizabeth and one Oshodi. However, on May 7, 2012, the company passed a resolution making the sons of Mr Obanikoro – Gbolahan and Babajide- and Ikenna Ezekwe signatories to the companies account. According to our source, Mr. Obanikoro raised Mr. Ezekwe after he lost his father. The source further explained that N2 billion was withdrawn in cash and on June 12, 2014, Mr Obanikoro, alongside some of his allies, personally moved N1.3 billion to Akure in a chartered aircraft. According to the source, N137 million was paid to Mr. Fayose’s personal account while N100 million was deposited in the account of Spotless Hotel, owned by Mr. Fayose, while another N700 million was credited to the account of De-Privateer Limited, owned by Mr. Agbele. “Sometimes in August 2014, Abiodun paid N118 million cash and N50 million in cash to make a total of N168 million into Fayose’s account. We are still analyzing those financial transaction,” the source added.